Inking Idaho: May FREE Tutorial - Pop Up Posies Kit! A new month, a new FREE tutorial with a $35 order to my online store! This one uses the Pop Up Posies kit from the Spring Catalog. 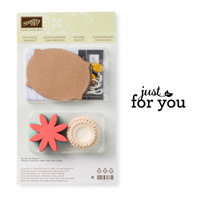 Kit includes everything for bright, flowery tags and projects - just add attitude. I lost track of how many times I said 'wow'. What a riot of creativity and fun! Love the signage, love the array of colorful food, and what a great use of a pool table!